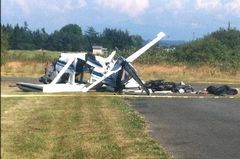 Aviation transportation officials have announced that the National Transportation Safety Board (NTSB) will begin an extensive investigation into the circumstances that may have led to a plane crash on Camano Island that left two passengers with serious injuries on August 4. Island County Sheriff’s Office spokesman Ed Wallace says the crash did not cause the plane to catch on fire, which is fortunate because that could have added to the degree of injury suffered by the passengers on board the plane at the time. But Wallace also added that the severity of the impact left the plane a total-loss. Bystanders who witnessed the plane accident rushed over to the scene to help administer medical attention to the crash victims, according to Yengoyan. Officials say that the man was transported to Providence Regional Medical Center in Everett because he was complaining of chest pain. The woman’s injuries were much more severe – she may have suffered a head injury in addition to broken ribs and a broken ankle – and she was taken to Harborview Medical Center in Seattle. The NTSB and Federal Aviation Administration (FAA) will be jointly conducting the investigation into the circumstances leading up to the crash, and there have been no additional details released. The man and woman could potentially have grounds for a personal injury claim in order to be reimbursed for the medical bills and other damages that they have incurred, providing that the plane’s owner had an adequate insurance policy that would cover bodily injury in the event of an accident.